La Cenerentola is not simply a comic opera. As its title and subtitle, La Cenerentola, ossia La Bontà in trionfo, taken together suggest, it presents both a character (Angelina – ‘La Cenerentola’) and her story, and a moral statement, literally ‘Goodness in Triumph’ or, as we might more comfortably say in English, ‘The Triumph of Goodness’. Of course, there is also much in the opera that is wonderfully funny, but a good production of the opera needs to find ways of balancing the comic and the moral Affirmations, while also doing justice to the sentiment(ality?) of the love between Ramiro and Angelina. The balance is not easily found, the simultaneity of various modes and attitudes not easily sustained. This revival of Joan Font’s 2007 production (the revival director is Font’s long-term colleague Xevi Dorca) comes closer than most to achieving it. Joan Font i Pujol founded the Catalan company ‘Els Comediants’ in 1971 and has been its Director/Artistic Director ever since. The company’s central aesthetic philosophy is grounded in a desire to explore ‘the festive spirit of human existence by reconnecting with myths, rituals and pagan ceremonies’ (click here). It belongs, in the widest sense, to the Bakhtinian mode of the carnivalesque, mocking and subverting false or hollow social hierarchies and moral blindness, with its energy, light and colour. 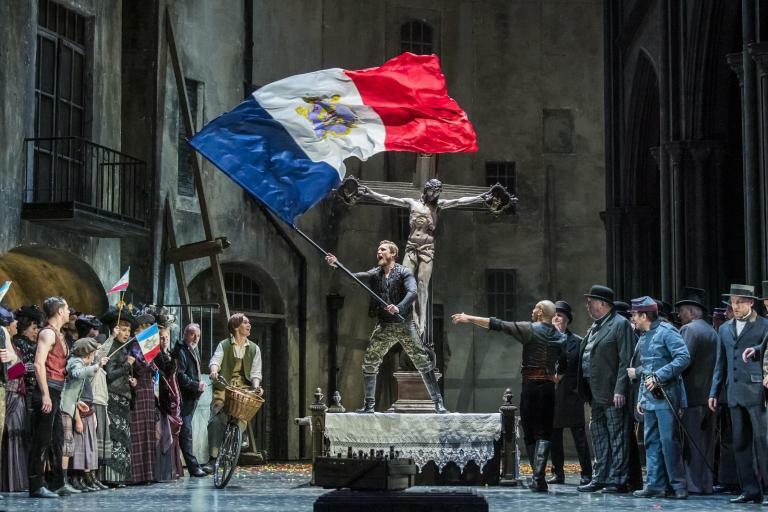 This production – which originated as a co-production between Welsh National Opera, Houston Grand Opera, Gran Teatre del Liceu (of Barcelona) and the Grand Théâtre de Genève – was first seen in Cardiff in 2007. It juxtaposes inventive humour and vividly coloured costumes and make-up with the moral hollowness of characters such as Don Magnifico, Tisbe and Clorinda. But it also respects and unemphatically articulates the underlying myth, that of Cinderella as retold, here, by Rossini and his librettist Giacopo Ferretti. While one doesn’t readily think of Rossini as a moralist, we certainly recognize him as a brilliant satirist – and these two artistic attitudes are surely closely related. The version of the familiar story which Rossini and Ferretti produced dispenses with the ‘magic’ common to most retellings of the story. As Font himself puts it (I quote this from the WNO programme): ‘This opera does not respect the original tale with regard to the use of the supernatural in helping to alter our heroine’s fate, but it does conserve the plot and social concept of the original. A ruined family is headed by Don Magnifico, an absurd, conceited and cruel man without scruples … He lives for his two biological daughters, Clorinda and Tisbe, who are characters interested only in escaping their miserable lives through marrying an aristocrat. Within this decadent world lives Angelina, Don Magnifico’s stepdaughter who goes by the name of Cenerentola and is the embodiment of good manners, simplicity, truth and generosity’. Rossini and Ferretti certainly take the morality of their fable very seriously. An incident early in Act I sets the tone, making it clear that our attitude towards Angelina should not simply be one of sympathy with her over her maltreatment; we should respect her for her innate goodness. There is a knocking at the door of Don Magnifico’s run-down palazzo. It is Alidoro, the royal tutor, disguised as a beggar, requesting ‘Un tantin di carit (a little charity). Clorinda and Tisbe, unsurprisingly, respond by telling him to go away – ‘Accattoni! Via dà qua!’, while Angelina quietly, one might say surreptitiously, offers ‘po’ di colazione’ (a little breakfast) of coffee and bread. The central Christian doctrine of charity has been affirmed, simply but forcefully, in the opening moments of the opera. The dignified Alidoro’s response confirms the moment’s significance: ‘Forse il Cielo il guiderdone pria di note vi darà’ (Perhaps Heaven our guide will reward you before night). Seeing what Angelina has done, Clorinda and Tisbe berate and threaten her. This motif – of goodness eventually getting its reward recurs insistently throughout the libretto. The libretto never mocks the good characters, however fiercely it strips bare the vanity, avarice, greed and cruelty of Don Magnifico, Tisbe and Clorinda. There is neat symmetry in the way in which Angelina’s act of kindness in the opening moments of the opera is complemented by a related, but different act of ‘kindness’ in the closing moments. When she becomes the bride of the prince she has Tisbe, Clorinda and their father at her mercy, as it were. She could punish them if she chose to, but it is precisely ‘mercy’ that she extends to them, in the form of forgiveness. She declares ‘Le antiche ingiurie mi svanir dalla mente. Sul trono io salgo, e voglio starve maggio del trono, e sarà mia vendetta il lor perdono’ (‘Old injustices have disappeared from my mind. I rise to the throne and want to become greater than the throne itself; my revenge shall be to forgive them’). Rather like The Tempest, La Cenerentola – which has more than a few unexpected similarities with Shakespeare’s play – is a perfect example of what one might call Revenge Comedy (as opposed to Revenge Tragedy). Font’s production, sympathetically revived by Dorca, is brilliantly funny at times, tenderly sentimental at others as well as having its moments of moral reinforcement, and it does something like justice to the surprising depth and variety of La Cenerentola. In terms of stagecraft, Font and his designer colleagues are gloriously inventive, whether, to take just two examples, in terms of the large sectional revolving mirror which turns into a coach, or the six splendid mice (well mimed and danced). The mice are amusing in their own right, whether in their parodic imitation of mouse-like movements, or in their anthropomorphized possession of human traits such as sympathy and moral revulsion – their reactions to the various human beings makes out of them a kind of mute choric commentary. They also fulfil a straightforward theatrical function – as stagehands moving props around as required! Elsewhere, costume and make-up are used very effectively to delineate dominant character traits – pomposity, vanity or moral vacuity, for example. There are some brilliant stage pictures, as when a drunken Don Magnifico is brought onstage astride a barrel on wheels, an ironic visual echo of some Roman and Italian Renaissance representations of the ‘mounted’ Bacchus. The pace throughout is rapid – though it never feels rushed – as befits much of Rossini’s music in the opera. Musically the evening was slightly mixed. Without ever quite convincing one that Rossini came entirely naturally to him, conductor Tomáš Hanus drew good work from the orchestra. Things sounded a little stiff in the overture (which Rossini recycled from La gazzetta, premiered two years before La Cenerentola), but seemed more comfortable when there were singers and action to work with. The men of the WNO Chorus (the women were not needed) were as musically assured as ever. Of the soloists, the most straightforwardly buffo of the characters, Don Magnifico, was very well sung, (with agile weight of voice, not least in his rapid patter aria) and acted by Fabio Capitanucci, in a fine comic performance which also never allowed us to forget just how nasty Don Magnifico is. Giorgio Cauduro was very amusing and adroit as Dandini and sang with fluidity and focus. Wojtek Gierlach was an authoritative Alidoro, bringing just the right degree of gravity to the role, which can easily seem either flippant or over solemn. When not disguised, he wore a costume of deep blue adorned with large stars – as though he were a kind of Enlightenment Magus. Of the men, only Matteo Macchioni was somewhat disappointing. I say ‘disappointing’, not because I have heard him sing before, but because an Italian friend who gets to lots of opera there, advised me to expect good things from him. However, for much of the evening he seemed rather stiff and inhibited, both vocally and in terms of stage presence, and wasn’t able to produce a truly Rossinian fluency (though he was a little better in Act II than he had been in Act I). Perhaps he was just having an off-night? Tara Erraught was excellent throughout and her voice had enough, but not too much, weight as well as an impressive top. Whether as the downtrodden (but not dispirited) Angelina at the beginning of the opera, singing her ‘old song’ of the king who married a kind-hearted woman, or in some of the coloratura writing Rossini produces for her later in the opera, she was able to adjust the weight and colour of her voice appropriately. Her ‘ugly’ sisters, (ugly only in moral terms) Aoife Miskelly and Heather Lowe presented us with well-sung caricatures. There isn’t much that can be done with Clorinda and Tisbe in terms of characterization – they are all surface, both psychologically and morally. In its variety and wit, and in its intelligence as well as its (never over-solemn) respect for its moral substance, this production of La Cenerentola prompts both a real joy in comic absurdity and a cooler reflection on human kindness and cruelty, charity and selfishness. My one reservation was with the ending – bringing Angelina back on stage in her old clothes, sweeping up again and singing the same thing she sang at the beginning of the opera, as if all that had happened between was no more than a dream. That does not tally with the libretto and I don’t find it an improvement. La Cenerentola was first performed (in Rome) in 1817. Just over two centuries later it still packs several punches, still makes us laugh, think and feel.